Here at Swansway Chester we're looking for outgoing, enthusiastic and energetic people to start their career with us within Car Sales. No matter what your background is, if you like to be part of a close-knit team and want a career where you can progress, then we want to talk to you! Swansway Chester is home to a number of leading car brands including Citroën, DS, Fiat, Jeep, Alfa Romeo, Abarth and Peugeot. As part of the sales team here at Swansway Chester you will be given all the help and guidance you need to flourish in your role and reap the benefits. Over the years, we've seen various people from various different career backgrounds join our team in Trainee roles and progress into fully fledged Sales Executives, Business Managers and more! Take a watch of our video to the right and see for yourself what it is really like to work as part of the Swansway Family. 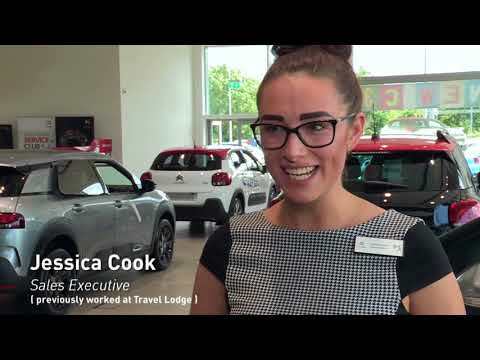 We are currently looking for a Trainee Sales Executives to join our teams at Citroën/DS, Fiat/Abarth/Jeep/Alfa Romeo and Peugeot in Chester, reporting into the Sales Manager you will be working as part of a large team responsible for the sale of new and used vehicles. As no prior experience is necessary for this role, during the first 6 months you will be working closely with existing Sales Executives to understand how our customers buy from us and to become an automotive product expert. You’ll attend regular training sessions and become a true brand ambassador where you put our customer at the heart of everything you do. Once you have learnt the role you’ll become a Sales Executive responsible for responding to customer enquiries via the phone, online and face to face. We are looking for candidates that have the drive and resilience to become a Sales Executive with us. You should be passionate about our brand and you should have an overall want to make money and have a long term career in vehicle sales. Swansway Group is a family owned and run motor group. We’ve been in the business over 50 years, so, we know a thing or two about the motor trade; and, more importantly for you, we also know a thing or two about creating a happy, motivated team! We’ve won lots of awards; some national, some local, some industry, all of them recognise that we’re a dynamic, forward thinking business, delivering an excellent experience whether you’re a customer or an employee. Being a family owned and run business, Swansway Group thrives on employees career development and we have many examples of long term employees who have undertaken many roles within the business.